Daniel Ricciardo says a podium in his final race for Red Bull would match any of his previous F1 top-three finishes. The Australian is switching to Renault for 2019 but has one chance left this weekend to end what has ultimately proved a frustrating season on a high. All 29 of Ricciardo's career podiums have come with his current team and he admits ending a six-month drought since his last one "would be as big as any podium I've got"
Ricciardo explained: "For two reasons: because it's my ending with this team for now but also this year when I've only stood there twice and that was for a win. I haven't had any seconds or thirds. 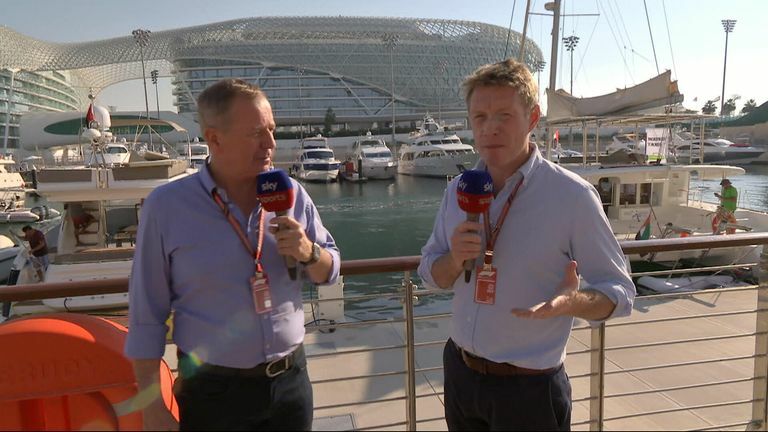 Simon Lazenby and Martin Brundle look ahead to the Abu Dhabi GP including Robert Kubica's return and Fernando Alonso's departure from F1. "Just as it's been such a long time between drinks, so to speak, so that in itself would be a big moment for me. But to close the book with Red Bull on the podium and see them all down there [in the pit lane] celebrating and spray some fake champagne, rosewater I think it is here, would be cool." Abu Dhabi's season finale ends not only a five-year relationship between Ricciardo and the Milton Keynes team but a 10-year one with the Red Bull company, which began when the Australian was an aspiring young driver. "I'm actually excited. Not excited because it's the last one, but more to the thought of finishing off in style - I don't want to say with a bang as that sounds bad! - with high spirits," added the Australian. "Everyone's been pretty cool. Normally Thursdays are pretty slow but everyone in the team has had a lot of energy today. At the moment it's 'let's have one last crack together, it's been an awesome ride the last five years so let's use every last bit of what we've got together to make it a successful weekend'. "Then Sunday night we'll party, drink, celebrate and maybe feel sad as well. We'll figure that out." With no podium finishes since winning the Monaco GP in May, Ricciardo has scant cause for celebratory Sunday evenings in recent months but is optimistic with all the last three events. "This sport is so confusing at the times. Even Brazil, I was amazed at the pace we had," said Ricciardo, who finished fourth from a penalised 11th on the grid at Interlagos. "At the start of the race coming through the traffic, normally you damage your tyres, but I could see I was still quicker than the Ferraris and the Mercedes'. I knew we had pace but I don't know if we got it right and the others got it wrong, but we've certainly been fast the last few races. "We know the car was capable of winning at all three of those races so that's positive. We're still getting updates on the car so it's still progressing, but it's not that we found something which was massive and we said 'this is now why we're going to win every race' it just seems like it's been an accumulation." 8.45am: Abu Dhabi GP Practice One build-up LIVE! 9am: ABU DHABI GP PRACTICE ONE LIVE! 12.45pm: Abu Dhabi GP Practice Two build-up LIVE! 1pm: ABU DHABI GP PRACTICE TWO LIVE! 9.45am: Abu Dhabi GP Practice Three build-up LIVE! 10am: ABU DHABI GP PRACTICE THREE LIVE! 12pm: Abu Dhabi GP Qualifying build-up LIVE! 1pm: ABU DHABI GP QUALIFYING LIVE! 12.30pm: On The Grid LIVE! 1.10pm: THE ABU DHABI GP LIVE!